Citation: C N Trueman "Woodrow Wilson’s Fourteen Points"
Congress in January 1918. 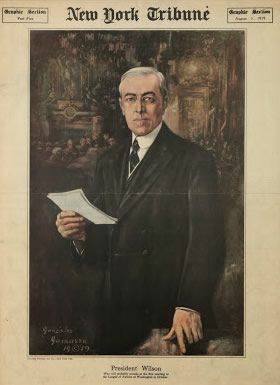 Wilson’s Fourteen Points became the basis for a peace programme and it was on the back of the Fourteen Points that Germany and her allies agreed to an armistice in November 1918. No more secret agreements (“Open covenants openly arrived at”). Free navigation of all seas. An end to all economic barriers between countries. Countries to reduce weapon numbers. Belgium should be independent like before the war. Self-determination should be allowed for all those living in Austria-Hungary. the old Turkish Empire should govern themselves. An independent Poland should be created which should have access to the sea.